JIU-JITSU GI sold at the lowest price, Guaranteed. 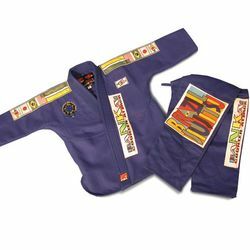 The gi (outfit, from Japanese jujutsu gi 'jiu-jitsu uniform') used in Brazilian jiu-jitsu was adapted from the uniform commonly used in Japanese martial arts. It is typically composed of a heavy cotton jacket and reinforced trousers. A cloth belt is worn over the gi, both to keep the jacket closed, and as a signifier of the skill/rank of the practitioner. The term kimono is sometimes used to describe the whole outfit, or occasionally just the jacket. Sizing normally follows (A0 - A7) for men's gis, but occasionally judogi sizing is used (1-7).